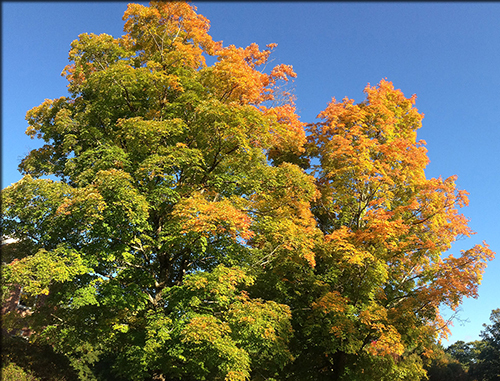 The iconic sugar maple, one of the most economically and ecologically important trees in the eastern United States and Canada, shows signs of being in a significant decline, according to research results published today (Oct. 21, 2015) in the open-access journal "Ecosphere." The research led by ESF scientists involved analysis of growth rings from hundreds of trees across the Adirondack Mountains in northern New York state. It showed that a decline in the growth rate began for a majority of sugar maple trees after 1970. The reasons for the decline are unclear. "Given their relatively young age and favorable competitive status in these forests, these sugar maples should be experiencing the best growth rates of their lives. It was a complete surprise to see their growth slow down like this," said Daniel Bishop, who conducted the study as part of his master's thesis at ESF. "But our data tells a clear story. We can detect the start of a region-wide downturn after 1970, with a large proportion of the trees continuing this trend over recent years." Sugar maple is arguably one of the most culturally important species in eastern North America. Prized for its high-quality wood and spectacular fall colors, sugar maple gets its Latin name - Acer saccharum - from its remarkably sweet sap ("saccharum" translates to "sweet"). This sweetness fuels a multibillion dollar syrup industry. Sugar maple is also an ecologically vital foundation of the region's northern hardwood forests, where it fosters more fertile soils, provides nutritious browse for wildlife, and supports a higher biodiversity of plants and soil organisms. Bishop's work built on an earlier study of acid rain impacts on sugar maple forests in the Adirondacks. That study, which showed lower regeneration and poor health of sugar maple in forests heavily impacted by acid rain, was led by Dr. Timothy Sullivan at E&S Environmental Chemistry of Corvallis, Oregon, and Dr. Gregory Lawrence at the U.S. Geological Survey in Troy, New York. In Bishop's study, researchers analyzed sugar maple growth rings from hundreds of trees across the Adirondacks and compared them to climate data during the same time period. The study was set across a range of soil degradation caused by acid rain, which is a major stressor for sugar maple and a chronic issue in the Adirondacks. The researchers expected that poor growing conditions related to acid rain would influence how the trees responded to a warming climate. "The last few decades have brought warmer and wetter conditions to the Adirondacks, which are typically good for plant growth," said Dr. Colin Beier, an associate professor of ecology at ESF who supervised Bishop's thesis research. "Meanwhile, there have been big strides in reducing acid rain, which is especially damaging to sugar maple. Given these changes, we would expect these trees to be thriving, but they are not." Beier said researchers do not know the reasons for the decline in growth. The detailed analysis conducted by Bishop and his co-authors did not find conclusive evidence that climate change or acid rain were the culprits - but Beier said this does not eliminate the possibility that these factors play a role. Such stressors can predispose trees to become less resistant to or tolerant of pests, diseases or other forms of stress. A number of factors, including insect outbreaks and late frost damage, are known to affect sugar maple. "Outside of studies of red spruce in the 1970s, I have never seen anything quite like this," said a study co-author, Dr. Neil Pederson, an ecologist at Harvard Forest in Massachusetts and an expert on tree rings and climate change. "Most tree-ring studies of canopy trees in the region do not show a decline like what we see in these sugar maple. Combined with evidence of reduced natural regeneration of sugar maple in the region, it is a concern." Bishop now works with Pederson as a researcher at Harvard Forest. A question remains regarding whether similar declines are occurring in New England and eastern Canada. Prior research by U.S. Forest Service Northern Research Station scientists suggests similar growth declines might be occurring widely across the region, but further study is needed to verify their observations. Beier said that although a suddenly slower pace of growth is not a sure sign that a tree's death is imminent, or that recovery is impossible, such changes when observed across a wide area can indicate a significant problem for a species. From a practical standpoint, lower growth rates have direct implications for the management of sugar maple forests, whether the focus is on wood products or sap and syrup production. Guidelines for sustainable tapping require an understanding of growth rates to minimize long-term damage to tree tissues, while foresters creating management plans need to know how rapidly trees are reaching commercial size. "Time will tell if slower growth is a harbinger of something more serious for sugar maple," said Beier. "But given the ecological, economic and cultural importance of this tree, the stakes could be high. We need to sort out whether these declines are more widespread, the reasons why they are occurring, and what their implications might be for our ecosystems and local economies."